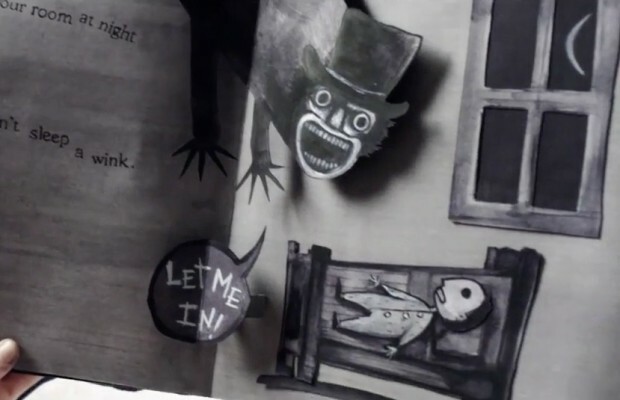 THE BABADOOK is an entity/spirit/nightmare that lives in the pages of a childrens book discovered by the unfortunate mother & son in this quite unsettling 2014 Australian indie. To start with, it is NOT a movie for kids unless you’re hugely irresponsible and want to traumatize them. It might not be the best item to watch like I did—alone, in a big house, on a foggy night, up in a heavily wooded area a thousand yards from the nearest human, with no handy .45 to put next to the ice cream I ate while wondering if that noise downstairs was just the horse bumping the garage door. ‘Scary’ movies generally deliver some telegraphed ‘jump’ or ‘jolt’ scenes or lazily drench you in goop designed to have you say “yuuck” and then laugh it off with whichever inmate you’re seated next to. This item had at least two bits that actually had my skin crawl with trace memory of that damned knotty pine paneling I had to endure in my bedroom when I was the age of the kid in this flick. Even the erstwhile silly name ‘Babadook’ sounds like a child’s breathlessly stuttered excuse not to go all the way to the other end of the house to brush their teeth–alone. “C’mon, you’re a big boy.” Like hell, I’m not as big as whatever lives in the closet and makes that chew-growl sound. Miniscule budget ($2m) called for inventiveness and writer/director Jennifer Kent brought it, getting universal critical acclaim and a double-down return on the invested money. The beleaguered mother is no-holding-back played by Essie Davis, the too-close-to-infuriating kidlet by six-year old Noah Wiseman. Horror fans will catch this and–well, I don’t know if enjoy is the right word–but they’ll appreciate the freak-out factor. Compendium types like me will live through it and check it off the list (then try to go to sleep without a Rottweiler or rocket launcher next to you). Other unsuspecting humans might want to think twice. It works on a number of levels, and had me thinking a lot about the whole Why-We-Fright gene that gets into our blood (before it leaks out) when we’re young and are utterly convinced there is something under the bed or in the attic or basement. Mothers ( Dads, too) who have had just-about-all-the-screaming-tantrum-nonsense they-can-handle might relate to Mom here, and that’s un-nerving as well, as the movie—like the 1953 classic Invaders From Mars— leaves kids in the position of being frightened of those closest to them–and that link gets maybe too close to the real horror many children have to deal with if they have abusive family conditions. Again–anyone who lets their kids under twelve watch this needs a shrink. While viewing, images of other Terror Tales may flicker across your Fear File—The Bad Seed, Poltergeist, Joshua ( Sam Rockwell sleeper)–but just when you think this is headed in that direction, Ms.Kent throws you down another dark alley. William Friedkin, director of The Exorcist, is quoted as saying “I’ve never seen a more terrifying film”. Ingenious–no–it’s fiendish—use of sound and shadow here. Mercifully only 93 minutes. Damn thing puts me in a quandary: recommended for its skill, notable for provoking discussion of its undercurrents, questionable in its motives. You have been warned.